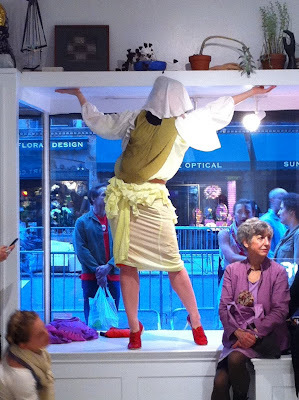 Recently, I was privy to Portable Arc, a performance that occurred at the retail store JF & Son located in the West Village. The brainchild of Travis Boyer MFT, the event was also a collaboration between Layla Childs and Sonya Robbins who founded robbinschilds’ in 2003 and focused on color-based motion and fabric as it moves across the body. The store was cleared out for the evening and contained dancers and designers in an interactive, time specific event. The performance was to last for approximately 30 minutes and started out with vocal sound: Orange. Red. Yellow. Green. Purple. Each performer repeated the color words into a microphone, recorded and looped via mixer, becoming a soundtrack to fluid movements then traced with ribbon. The figures intersected space, weaving in and out, occupying the designated area which had been marked on the floor by drawn rectangles. 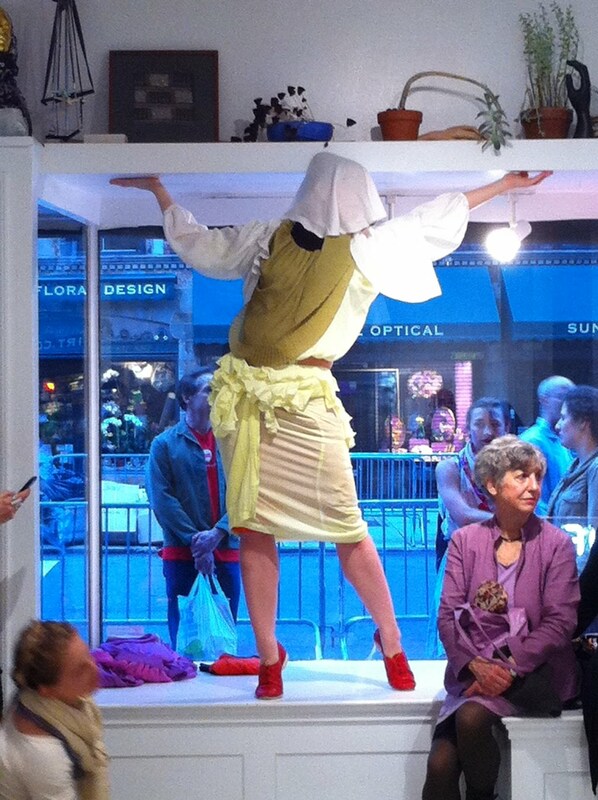 During the performance two of the dancers, moved into the main window at the front of the space. Passersby stopped and stared. Some took out their cellphones and snapped pictures while others tapped friends and pointed. The interaction between internal viewer, external viewer and performer was lovely. Also present was artist K8 Hardy, who I have written about here before. We spoke for a bit and she introduced me to Travis as well as informed me that they’ve collaborated in an art meets fashion performance called J’APPROVE. J’adore. 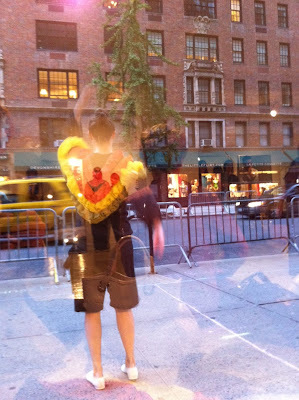 The performers proceeded to dress and undress in the window. They briefly revealed undergarments and one of the dancers extended, pregnant belly, gyrating and contorting their bodies in and out of the malleable, colored fabric. 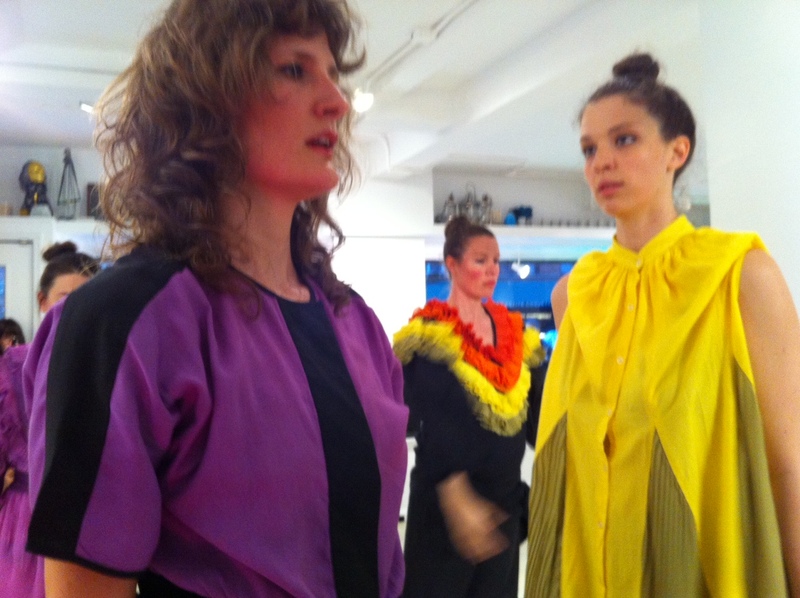 Portable Arc focused on wearable art that also was a declaration of robbinschilds’ dedication to rainbow living. The garments are also available for sale, contact JF&Son for further inquiry. Thanks to Michelle Finocchi for the invitation.